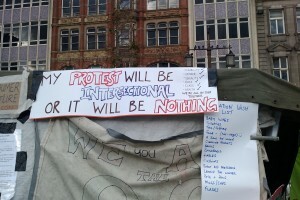 So, there seem to be a few occupations going on, including my local Occupy Nottingham. One of this things I’ve found interesting is the language that’s emerging. This post examines the language of the “we are the 99% tumblr. Meanwhile, Tiger Beatdown has some interesting analysis of who exactly is the 1% and an insightful, moving essay about the range of experiences of wealth, poverty and class found within the 99%. I’ve also been thinking about who an occupation excludes. I’d define an occupation as a radical reclamation of space where alternatives to mainstream society can be explored – things like communal living, consensus decision making, and sharing the work needed to sustain a community. However, the fact remains that we are products of this mainstream society and have internalised some of its toxic elements – sexism, racism, homophobia, transphobia, ableism, classism to name a handful. In a social justice context, not having to encounter these things are often described as ‘privileges’. There’s lots of material out there on privilege but I particularly like this primer on privilege and what we can do about it. It’s important to note that, while these can be manifested in individual interactions, they’re also embedded and reinforced by social institutions. that person also can ignore systemic nature of racism. That person can pretend that racial issues can be solved by making people act nicer to each other; however, focusing on eliminating prejudice and racism between individuals can obscure the need for eliminating the racism that is so deeply ingrained in our social institutions. This is particularly important when engaging in the anti-cuts movement – how are you going to protest cuts to EMA disproportionately affecting women and ethnic minorities if you don’t see race and gender, or believe that racism and sexism can be addressed by everyone just being a bit nicer to each other? Even in movements that are formally leaderless, those with privilege tend to bring pre-existing power to the table, and that power can be dangerous. This is part of any communal space, no matter how well-intended; I can testify that, even in my own best efforts, and even with trusted friends, I’ve brought my own privilege to the table, created invisible hierarchies, and hurt people. Addressing how power works — who is seen to be powerful, who is exercising power, which kinds, and why, and how that looks like the old world and old structures of oppression we are trying to break away from — has to be a central part of any radical movement. It’s hard to focus on what marginalized people are saying, when they’re reduced to a collection of photos for the purpose of telling us that they’re “hot.” The act of finding those voices, actively seeking them out, and listening to them, is harder than taking a photo. It’s also the work that can and must be done. Failing to address sexism leads to sexual assault, and attempts to intimidate and silence those trying to address it, as seen in Occupy Glasgow. All Of Us Deserve To Feel Safe has published response cards as “a way of communicating to someone that they’ve made a space unsafe without having to deal with potentially intimidating confrontation. It includes a list of different ways that spaces can be made unsafe, with checkboxes for the relevant concerns.” They also have flyers with suggestions on how to make a space safer. In addition to their very helpful suggestions, I’d like to comment that how labour is divided in the occupation is important. It’s not okay for men to be sitting around with mugs of tea while the women wash up, sort out the recycling, collect water and so on. I’ve seen this in an occupation before and it was shocking that these so-called radical men were content to allow this gendered division of labour to happen. This is some of the most visible stuff in an occupation – if you can’t manage to make this equal in your own space, how are you in a position to call for a fairer and more equal society? I also think it’s important to not to treat any member of a minority group as a spokesperson. Sometimes, when I’ve wandered along to an occupation, I’ve immediately been pounced on and asked how they can make the occupation more friendly to ethnic minorities or women. I’m very glad that they’re thinking about this, but aside from the assumptions this makes about my gender identity, it also makes me feel like I’ve become a token minority – that I’m happy to have these conversations at their convenience, that I’m happy to have these sometimes difficult and exhausting conversations on demand. Sometimes I just want a brew and a chat, not to give an immediate workshop on anti-racism. Finally, it’s crucial to listen. Creating an anti-oppressive space means that people belonging to less privileged groups will critique your efforts, and it’s essential that you listen to these criticisms and respond to them in a constructive manner rather than becoming defensive or aggressive. As the open letter to Occupy Glasgow shows, if someone criticises an occupation for allowing or enabling systematic oppression, she can be insulted, bullied and accused of trying to shut the occupation down from within. This is unacceptable behaviour – it silences the activists who did complain, it allows sexists a free pass, and it stops people making other criticisms. It can be difficult to hear criticism, but ultimately criticism coming from activists who are sympathetic to the movement comes from a place of caring and wanting the movement to be as inclusive as possible. An occupation has to practice what it preaches. You cannot call for an end of one kind of oppression while perpetuating, however unconsciously, other kinds of oppressions and, however accidentally, silencing the voices of (other) minorities. One of the questions that came up at the conference was the links between the women’s suffrage movement and protest movements today. There are a couple of points that I think are particularly interesting, although there are bound to be others. In any large protest movement there are going to be different factions, each with different ideologies, aims, motivations and so on. I’ve seen it first hand in the current anti-cuts movement, particularly within the student movement and even within the group in my university. This isn’t a bad comparison because I think both movements are issues-based and attract people of a huge range of political beliefs. There are things that unite us but these tend to be quite broad things – general opposition to education and welfare cuts, for example. The things that can be divisive are in the details – what action do we carry out? do we support occupation? is it okay to ally ourselves with trade union groups? communist groups? anarchist collectives? how do we organise ourselves? how do we make decisions? how do we respond to other groups and their campaigns? to whom do we express solidarity? These things are not always simple, and there have been passionate debates about these issues. The suffrage movement had broad agreement that the franchise should be extended to (some) women, but organisations could differ wildly on the details – should the vote be extended to all women or to women on the same basis as men, with financial and property requirements in place? what should be the role of men? how much independence was needed and/or desirable from political parties? were they happy with contemporary gender norms? what was the vote for – was it a symbolic gesture of women’s equality, or could it be used to improve women’s working conditions, pay and welfare? Not easy questions, and quite often no right answers. The second point of comparison is what counts as violence, and how individuals and groups within the movement respond to direct action carried out by others in the movement. In my research, one of the things I come across is that violence was carried out against property; this happens today as well. There are numerous accounts of WSPU speakers being verbally and physically abused by men at public meetings and requiring police protection, yet this doesn’t seem to get described as violence. Instead, violence is what happens when suffragette campaigners break windows. I note that Alfie Meadows, the student who had to have emergency brain surgery after being injured in the protests, has been charged with violent disorder (this post discusses it in more detail). Then as now, (some) property seems to be more important than (some) people. There are also similarities in how those who don’t engage in property damage or other less socially sanctioned methods of direct action respond to those who do. While I was disappointed at the reaction to Millbank, I wasn’t surprised. Those who carried out property damage and so on were said to be attention seekers, their status as “proper” members of the movement challenged, and others in the movement tried to distance themselves as much as possible from the window-breakers. Sound familiar? I suspect that these issues are ones that any protest movement has to negotiate – they’re not unique to movements. 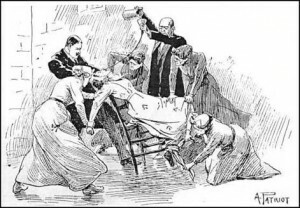 There are points of connection between the suffrage movement and what’s happening today, particularly when it comes to how damage to public property and injury to protesters are discussed, and it’s these points of connection that think are interesting. In happier news, my favourite bookshop turns 37 this weekend – happy birthday News from Nowhere! Here’s some of their history for the interested. On Saturday, over 500,000 people took part in the March for the Alternative. The Guardian live-blogged it (first part, second part) and for the majority, it was a peaceful and diverse march. At some point, some protesters seem to have headed to Oxford Street to engage in some direct action, namely occupying Fortnum & Masons (and were duly kettled upon leaving, having been told they’d be free to leave the area), and in a late evening a large group gathered at Trafalgar Square, apparently to rest, catch up, swap news and so on. At this point something happened, and the police responded by kettling them. People’s experiences could be very different depending on where they were and when – one person was baton charged by the police, Laurie Penny was caught in the Trafalgar Square kettle, this young blogger found himself protecting a girl whose arm was broken by the police in the Trafalgar Square kettle and Katie writes about the march and Trafalgar Square and the aftermath as a St John’s Ambulance first aider. The reaction from the conservative press was predictable but again, people were anxious to distance themselves from those not participating in the march and engaging in different forms of direct action. Aside from the debate about acceptable and unacceptable forms of protest which is probably as old as protest itself, I find it really interesting how the term “black bloc” is used. I understand it as a tactic (as this FAQ explains): a black bloc is a temporary gathering of people with different ideologies and aims working together for the duration of a march etc. Wearing similar clothes promotes solidarity, is highly visible and hinders identification, particularly by Forward Intelligence Teams. What it is not, however, is an organisation. To my knowledge, there is no black bloc membership list. There is no black bloc committee. It forms on the ground, and dissolves afterwards. The individuals involved might have connections to each other, but the black bloc itself is not the organisation that they belong to. As a linguist, what I find interesting are the different ways the black bloc is discussed in this current round of articles. Not so much the evaluative stance, but the concept of the black bloc itself. This term is not being disputed in the press – instead, it seems to be misunderstood and the misunderstanding apparently goes unchallenged. I suspect there’s a power dynamic in that those most likely to participate in a black bloc and understand it are not likely to have a powerful voice in the press; the people writing about the black bloc in the newspapers are unlikely to be the ones with direct experience of it. And so “Black Bloc(k)” seems to become an identity rather than a tactic. It makes me wonder how prevalent this is, both diachronically and across domains. Is this a fairly standard feature of mainstream press discourse about the black bloc? Is it something more recent – was the black bloc discussed differently in the 1990s/early 2000s/mid-2000s to now? Is the black bloc understood differently when taking part in different kinds of protest e.g. anti-war, environmental, anti-cuts (even if these issues are often closely connected)? Has the term become more widespread, or used more frequently? This is the kind of research that lends itself to corpus research methodologies – focusing on a limited number of terms where a) the term is crucial to identifying the group being discussed and b) the term itself is what’s interesting. There may well be incidences of “protesters dressed in black” and so on, but I’m not convinced that identifies the protesters explicitly enough to know that it’s a black bloc being discussed. Because the black bloc itself is a somewhat nebulous concept – its power lies in its lack of organisation and definition – it becomes a site for projection. Do you want the black bloc to be full of violent hooligans, justifiably angry disenfranchised working class kids, rentamob thugs? Again, this seems more about identity than discussing the black bloc as a tactic. If I didn’t have a conference paper to write I’d be creating a custom corpus with WebBootCaT, but the paper must take precedence. The custom corpus will have to wait a couple of weeks.